In keeping with one of SABR’s objectives—“To encourage further research and literary efforts to establish and maintain the accurate historical record of baseball”—the Society has promoted numerous research initiatives. One such effort, the BioProject (archived online at SABR.org/bioproject), has generated large amounts of information in its mission to publish biographical articles about everyone who ever played or influenced baseball. The BioProject’s stated goal is to create “comprehensive biographical articles on any person who ever played or managed in the major leagues, as well as other persons who touched baseball in a significant way.” Over 400 contributors have generated more than 2,000 biographies. Some have provided a single entry, others over 100 pieces. The original scope of this project has expanded to include team biographies, essays on ballparks, and significant executives of the game. Biographies range from the obscure (Fred Bratschi) to the famous (Jackie Robinson). The BioProject is not only a boon to readers, but to the researchers who create the articles. The research has fulfilled curiosity and generated enjoyment for countless SABR members seeking to learn more about the lives of childhood heroes or members of a favorite team. 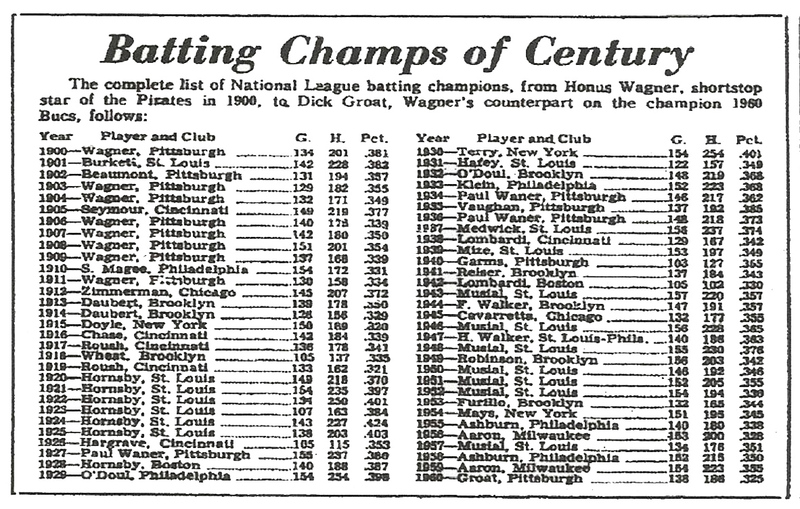 Names from the 1930s and 1940s lists such as Stan Musial, Jackie Robinson, and Paul Waner were easily recognized. One name, however, proved an enigma: Debs Garms, the 1940 batting champion. His odd first name drew my immediate interest, as well as the fact he played in only 103 games, abnormally low for a batting leader. He was an enigma shrouded in mystery. While perusing various baseball publications over the years, I would occasionally see Garms’s name pop up. Most references were to the odd circumstances under which he won the title. Decades passed and little more information surfaced describing his career—until a few years ago when I noticed the SABR BioProject. I saw new biographies appearing every few weeks on the SABR website. Virtually every article came with footnotes referencing sources available to even a casual historian. This encouraged my interest in the project. Almost simultaneously, while involved in the history program at San Francisco State University, I chanced upon a class by the late Dr. Jules Tygiel. The course involved acquainting budding historians with modern technological research tools to aid them in research. Analyzing dusty manuscripts in vaulted archives did not have to be a researcher’s lot in life. Microfilm, publications through interlibrary loans, and a host of online sources offered a wide range of readily available information on which to draw. Tygiel introduced sites for exploring census reports and search engines to find individuals. Access to historical archives, catalogs, and newspapers became easy. Occasionally Tygiel described reference sites dealing with baseball. I had read Tygiel’s Baseball’s Great Experiment: Jackie Robinson and His Legacy many years before and missed the connection between the self-effacing professor and his literary classic.3 Only when he delved into things “baseball” did I make the connection. Tygiel’s knowledge of baseball, research techniques, and personal encouragement inspired me to tackle a biography.4 And who better to write about than the mysterious 1940 batting champion whose name had intrigued me for decades? As I prepared to delve into Garms’s career, SABR’s library of resources immediately came into play. How to Do Baseball Research, a SABR publication edited by Gerald Tomlinson, proved a literal blueprint on the task.5 Advice was relevant from page one. “Write about something original” it noted; Garms certainly filled that bill. “Learn all you can about your subject,” the booklet further advised. It also identified numerous informational resources. Among these was baseball’s classic weekly newspaper, The Sporting News. Accessed online free of charge as a SABR member perk, digitized images of each issue were available and searchable. Initially, the task of exploring Garms’s life and career seemed overwhelming to me. His playing days had ended over 60 years earlier. There were no books or major pieces about him. However, there were numerous articles in TSN’s digitized archives that provided a rich background on his career, often commenting on his style of play, successes, and setbacks. Additional sites such as Mid-Continent Public Library generated entrée to additional newspaper coverage. While not as extensive as TSN, The New York Times, San Francisco Chronicle, and Washington Post each contained pertinent items. I sent correspondence to fellow SABR members such as Bill Borst, Bill James, and Bill Mead, each of whom had mentioned Garms in their works. While often these correspondents had little in the way of new information, their replies frequently suggested other avenues I might pursue. The National Baseball Hall of Fame in Cooperstown has a file, thick or thin, on every major league player. By simply writing to the Hall one can get, often at nominal cost, copies of what is available. Since I began writing biographies, I send the Hall all of the research material that I have generated on individuals, including information about contact sources, for inclusion in those files. Those materials become available for the next researcher who inquires about those players. Was David still alive, I wondered, and if so, could he be located? The online telephone directory listings revealed a David Garms living in Texas. At this point, I felt keen appreciation that I was researching Garms, and not a Brown, Jones, or Smith. I composed a respectful letter to David, apologized for intruding on his privacy, describing my background and SABR’s, and what I was hoping to achieve under SABR’s auspices. The letter ended with a request for assistance with the biography. Several weeks later David Garms called. Having read my letter and made inquiries about SABR, he decided to respond. Not expecting a phone call, I initially felt unprepared, but here again Tomlinson’s booklet aided my efforts: “Know your subject.” My research had created a working knowledge of Garms’s career for me, and during our discussion this became evident to David. He felt my endeavor to write about his father was clearly a serious and sincere effort. That awareness seemed to generate confidence in the project. At the conclusion of our talk Garms offered to cooperate, be it via mail, phone, or in person. David’s description of materials available to him suggested the best way to advance the work was for me to visit him. I arranged an appointment a few weeks later. In the interim, my research continued. Dr. Tygiel, always generous with his time, agreed to meet once I had told him the nature of my work. Interviewing was my weakest area. Tygiel had met with countless individuals in writing about Robinson. My question was, how did he approach interviews? While Tygiel underscored the need to be well prepared for the interview, he also gave a key piece of advice: “You may hear a lot of stories, some of which are not true—for they are just that: stories. The temptation to interrupt and correct is great. But don’t do it. Almost invariably, a wall comes between you and the interviewee if you do so. Time enough in the subsequent editing of your work to correct misstatements. Do not interrupt after asking a question. Just listen. You may learn something about the subject previously unknown to you.” Prophetic words. I had drawn up dozens of questions anticipating the interview. Almost without exception they were too detailed or restricting—“What was it like to play alongside Stan Musial?” etc. Tygiel suggested following more open-ended lines of inquiry. Allowing David to reminisce would increase the possibility I would learn things I hadn’t even known to ask about. The old adage “You don’t know what you don’t know” proved true throughout our conversation. When David and I met, my first question was along the lines of, “Tell me about your father’s experiences as a young boy.” Payoff was immediate. Several articles from TSN and others suggested Garms’s first name was in honor of Eugene Debs, an early twentieth century Socialist leader. Was this true or just a figment of some baseball scribe’s imagination? Merely because something finds its way into print does not make it accurate. Primary sources trump the written word—a point also noted in Tomlinson’s publication.10 While recollecting his father’s early life, David not only confirmed this was how the name Debs came about, but also revealed that a younger brother had been named Berger after another prominent Socialist of the time, Victor Berger, and that Berger had subsequently changed his name to Kinnie. This was not of major significance, but was something I might not have learned if I had merely asked, “Is it true your father was named after Eugene Debs?” Conversation continued that day and the next in the same vein. David acquainted me with many facets of his father’s career and life, most of which ended up being included in his biography. The discussion flowed well. It was obvious that David took our meeting seriously; he was prepared with an album of his father’s playing days. While writing subsequent biographies it became clear to me that often players or their families have folders, scrapbooks, or clippings about their careers. Having access to such materials proved invaluable in creating several biographies. These personal collections often contain interviews with local sportswriters done after the player retired. Garms’s insight into the managerial style of Rogers Hornsby—something that he would never have shared while he was still playing—was an important addition in my understanding of Garms’s time with the St. Louis Browns. Several articles referenced his passing in 1984. One quoted retired baseball executive and manager Bobby Bragan, who, as a Philadelphia Phillie, had played against Garms in 1940. Through use of The Baseball Autograph Collector’s Handbook, I was able to find Bragan’s address and wrote him, asking if he could provide any insight into Garms’s career.11 Bragan, then 90, called soon thereafter. During our conversation, I kept in mind that asking him to speak of a player from nearly 70 years past was problematic. While remembering Garms, his initial recollections were generic (“great competitor,” “good man,” etc.). Here I recalled Tygiel’s caution to be patient. Then Bragan, in passing, noted that Garms had punished Phillies pitching that year. He was right, a check of data confirmed Garms hitting .431 against Philadelphia. Another piece of information that might not have come to light had I been impatient. Not every former player responds to queries, but Bragan’s was rewarding. Frank Sullivan and Bob Turley, among others, also offered unique perspectives only a player can share. Time with David proved fruitful. The interviews could have been completed in a single day, but spread over two days as our meetings were proved to be a boon. This allowed me to consolidate my notes and insure that pertinent points were covered and to determine which still needed clarification. David also revealed a side of players’ lives seldom discussed. The career of a major leaguer is extremely tenuous. One is under unrelenting pressure to perform and a career is in constant jeopardy. Twice Garms went to the minors; a third demotion was narrowly averted. While he enjoyed playing, it was never far from his mind that his ability to play well allowed him to support his family. That family is a major factor in the lives of ballplayers became apparent. When asked why his father turned down a chance to be a manager, David recalled that his father decided traveling and being away from his family for long stretches of time was not worth continuing in the game. Discussion of Garms’s life with his son reminded me that baseball involves more than key games, pennant races, and statistical achievements. Though David provided a great deal of information about his father, much of it needed verification. For instance, he noted that in a game critical to Garms’s career, he made three of the team’s four hits against a knuckleball pitcher he had played with in the minors. Was that true or just a story? Research of Baseball-Reference.com revealed that on May 14, 1938, Garms had indeed collected three hits against a Brooklyn Dodger named Forest “Tot” Pressnell, whose biography confirmed he was a knuckleballer. A check of his and Garms’s minor league careers showed their paths had crossed while in the Texas and Western Leagues. Although David Garms’s comments were mostly correct, he had little to offer in the way of anecdotes concerning his father’s quest for the batting title. The story behind that achievement would have to come from other sources. Through interlibrary loan I gained access to microfilm of the Pittsburgh Sun-Telegraph, which covered Garms’s play in 1940. It became increasingly clear as I delved further that I also needed complete records of his day-to-day performance. At the time, Retrosheet did not cover most of the seasons Garms played. I emailed David Smith, founder of Retrosheet, who supplied copies of ledger sheets of hand-written records of batting performances, as was the 1940 practice. Coming from an age of instantaneous access to data, I found viewing hand-entered statistical data fascinating. From these sheets, I accurately determined Garms’s performance. The Sun-Telegraph chronicled that Garms missed numerous games, not because he was a “secondary” player as has often been characterized, but because of injuries.13 Articles in TSN, Washington Post, and San Francisco Chronicle contrasted Garms’s hot hitting with nominal batting leaders posting low averages.14 By mid-September, the leading hitters were near or below .320, subpar for batting leaders during that era.15 At the same time, data supplied by Smith reflected that a surge in hitting through August and early September had lifted Garms’s average into the .380s. My interview with David Garms also touched upon what seemed to be an unbelievable feat. David had noted his father was quite a pinch-hitter and claimed that he had made seven straight pinch-hits, made an out, then three more pinch-hits. The original Baseball Encyclopedia carried pinch-hitting records. I had already made a note that Garms had led the league in pinch hits in 1941; the Encyclopedia noted his having made 10. That they were nearly all strung together as David suggested seemed highly unlikely. Another query to David Smith brought forth day-by-day records of Garms’s 1941 season. They revealed that he made three consecutive pinch hits, an out and then six straight pinch hits. An impressive feat, but not quite in agreement with David’s recollection. Which was correct? I continued to delve. In the first season I became interested in baseball, 1958, there was much ado about Dave Philley breaking the record for seven straight pinch hits held by Peanuts Lowrey in 1952. Whose record had Lowrey had broken? TSN, in covering Lowrey’s feat, noted he had surpassed Rogers Hornsby’s record of five, set in 1933.18 Where did that put Garms? Another interlibrary loan request was made, this time for the Sun-Telegraph covering 1941. Box scores and descriptions of the games agreed with Smith’s data—up to a point. Smith’s information showed Garms’s six straight pinch hits before entering the lineup at third base. Several weeks later he came into a game as a pinch hitter and made an out, seemingly stopping his streak at six. Yet David’s claim was for seven straight pinch hits. I examined the records again. One of Garms’s appearances at third base seemed odd. July 26 game statistics showed him with just one at bat, hitting a two-run home run in the eighth inning. Here, access to the Sun-Telegraph’s account of the game proved critical. Garms had entered the game in the eighth inning as a pinch hitter and hit the home run. He remained in the game at third for the ninth. Checking other accounts of the game not only confirmed Garms pinch-hitting a home run, but also that it represented his seventh straight pinch hit. Garms, not Lowrey, had broken Hornsby’s record. Lowrey had tied Garms and Philley had broken their jointly held record. 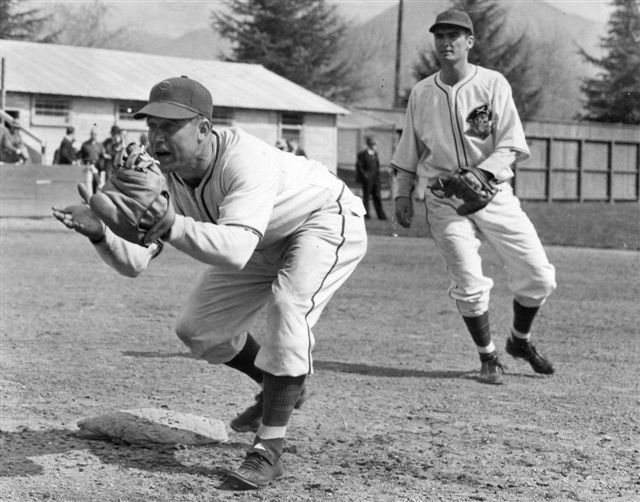 A few years later, when Retrosheet issued data on the 1941 season, their records reflected Garms as having played third that day. I contacted David Smith with my findings, Retrosheet independently verified them, and a subsequent change was made in the records to show Garms entered the game as a pinch hitter. My research began with a quest to tell the story of a player. That process served to generate a change in official records of the game, albeit a minor one. In the scheme of baseball’s history this finding is of little importance — numerous changes are being made to the record books all the time as new data are uncovered. That said, verification of David’s recollections proved rewarding to him and was a satisfying and unexpected bonus for me while generating original research for the BioProject. Subsequent articles I have worked on have provided their own satisfaction. I learned about Leo Kiely, a journeyman pitcher for the Red Sox, whose accomplishment in winning 20 games as a relief pitcher while with the minor league San Francisco Seals was unique in baseball history—and then I learned that it was not.19 I listened to Bill Slayback describe throwing a no-hitter into the eighth inning of his first game in the majors and everyone in the ballpark knowing of this development—except Slayback. These discoveries, and the opportunities to meet and/or correspond with players, their families, and fellow SABR members have proved rewarding to me. In keeping with SABR’s goal “To encourage further research and literary efforts to establish and maintain the accurate historical record of baseball,” I will continue seeking those rewards. GREG ERION is a retired executive from the railroad industry. He and his wife live in South San Francisco, California. Greg teaches history part time at Skyline Community College. He is currently working on a book about the 1959 season. 1. Although creating a biography may seem a daunting task, the path is well marked. SABR offers access to numerous resources for prospective contributors, including guidelines on how to conduct research and prepare articles, as well as lists of resources for historic and statistical data. One need not undertake the path alone. Whether through collective or direct inquiries, other SABR members are available to add their expertise, sharing advice, perspectives, information, or if need be, criticism. A biographer’s draft effort also passes through the hands of an editor who reviews it for accuracy and style, which invariably improves the final product. 2. See for example The Sporting News issue of February 1, 1961, page 15. 3. Tygiel, Jules Baseball’s Great Experiment: Jackie Robinson and His Legacy. New York: Oxford University Press, 1983. 4. Tygiel was posthumously awarded SABR’s Henry Chadwick Award in 2010. 5. Gerald Tomlinson, ed., How to Do Baseball Research (Cleveland, OH: SABR, 2000). 6. See for example: Litwhiler, Danny, Danny Litwhiler, Living the Baseball Dream, Philadelphia: Temple University Press, 2006, 176; Barthel, Thomas, Pepper Martin, A Baseball Biography, (Jefferson, NC: McFarland & Company, Inc., 2003), 183-184; and Stan Musial including, Musial, Stan as told to Bob Broeg, Stan Musial: "The Man's" Own Story, (New York: Doubleday & Company, 1964) 272. 7. Borst, Bill, The Best of Seasons: The 1944 St. Louis Cardinals and St. Louis Browns, (Jefferson, NC: McFarland & Company, 1995) 277 and Mead, William B., Even The Browns: The Zany, True Story of Baseball in the Early Forties (Chicago: Contemporary Books, Inc., 1978), 206 were two of several books on teams Garms played with. 8. Goldman, Steven, Forging Genius: The Making of Casey Stengel, (Washington, D.C.: Potomac Books, Inc., 2005). 9. Doyle, Charles J. "Rancher Debs Hardens Himself and His Bats With Outdoor Life," The Sporting News, December 26, 1940. 11. Smalling, Jack, The Baseball Autograph Collector’s Handbook, USA, 2007. 12. Garms at 34, married, with a son and a bad knee was ineligible for the draft. 13. See for instance, Mehno, John, The Chronicle of Baseball: A Century of Major League Action, London: Carlton Books Limited, 2000, 131. 14. See for example John Lardner, "Who's N.L. 's best hitter? Read on and be surprised." San Francisco Chronicle, September 11, 1940, and "Just a Joke,' Says Diz Dean of N.L.," Washington Post, September 18, 1940. 15. On September 14, 1940, the New York Times showed Johnny Cooney at .319, one point ahead of Johnny Mize. 16. Up to that point the lowest average to lead the NL was Larry Doyle’s .320 in 1915. After Garms final .355 average, the next highest among “full time” players belonged to the Chicago Cubs’ Stan Hack at .317. 17. See Baseball Rule 120:22. 18. "Peanuts Sets Major Mark — Seven Pinch Hits in Row," The Sporting News, June 18, 1952. 19. The same year (1957) Kiely won 20 games in relief with the Seals; a career minor leaguer named Don Nichols won 22 games in relief for the Peoria Chiefs in the Class B Three-I League.